This may be the most challenging reading I’ll be doing in years. Full details here. A few articles about the reading at Spaces last week. Here’s one in The New Indian Express – the scan, and the text link. Here’s a very thoughtful one at myLaw.net. Thank you, everybody, who came or sent good wishes. Sharanya Manivannan’s first book of poetry, Witchcraft, was released in 2008. It was acclaimed in The Straits Times as “sensuous and spiritual, delicate and dangerous and as full as the moon reflected in a knife”. Since then, Sharanya has been working on two different manuscripts of poems. Bulletproof Offering, explores the impossible loves of Sita and Lucifer, the earth and the earthbound angel. Cadaver Exquisito takes as its central motifs dismemberment, grief and the sights, smells and scenes of the city of Chennai. While some of the poems in these manuscripts have found homes in journals including Drunken Boat, Pratilipi, Dark Sky Magazine, The Nervous Breakdown and Superstition Review, many are yet unpublished — and most have never been shared with an audience. 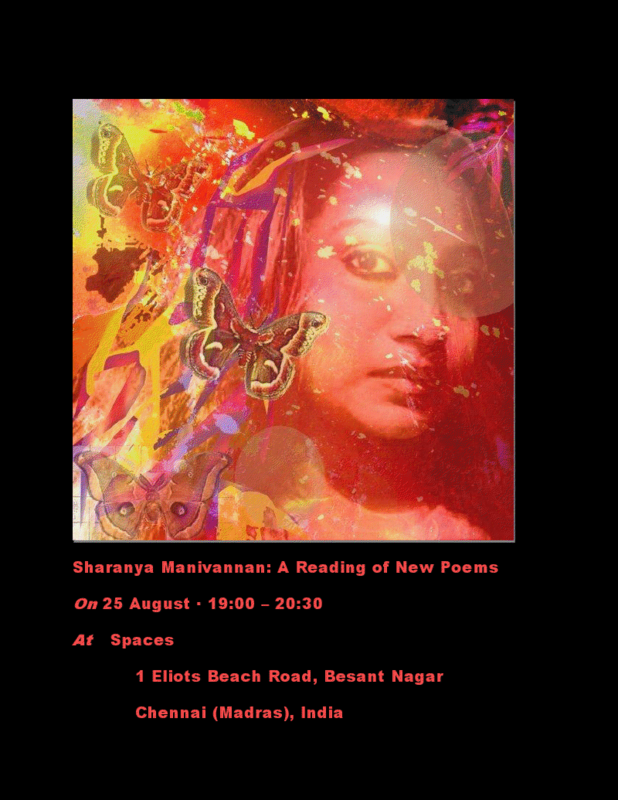 You are warmly invited to an intimate evening of listening to new poems by Sharanya Manivannan. It’s an honour to be one of Yalini Dream’s special guest performers at her show at Spaces, Besant Nagar (1 Elliots Beach Road, Chennai) tomorrow. The show will start at 7pm, and will also feature Shailja Patel and Ramki Ramakrishnan (on veena). I will read for about five or ten minutes — my work is the least performative among tomorrow’s poets, so I hope you won’t mind me mellowing the evening out for a little bit! I’m sorry this is both last minute and rushed and I haven’t provided all the relevant links – I encourage you to look up more details! Pride month is well underway, and you can see a full list of events happening in Chennai through June here. Among them is “Mozhiudal”, a poetry reading and open mic at Madras Terrace House on June 12, featuring Salma and myself. All are welcome – you can share either your original poetry, or poetry that you love which fits the theme. More about “Mozhiudal” is on the flyer below (click to enlarge). Some of you know that I lost my grandmother last October. Fewer of you, I think, know what kind of rocky ride the almost-year since has been. What you’ve probably noticed either way is that I no longer blog unless it’s to archive my journalism work, link to press about me or to poems published, or to publicize my (very few) events. I’m not going to go into my disengagement with the online life any further right now, except to say that today I came across that most rare thing: something that makes me want to blog, that I simply must share. I’d never heard of Mayda del Valle before, but I won’t forget her name now. Here she is at the White House with a searingly powerful performance of a poem that made me cry both times I watched it, for reasons too private and too sacred to discuss now. If you’d like to read the poem, it’s here. on Friday, March 13 2009 at 6 p.m.